October has finally arrived. It is one of my favorite months of the year....the cool fall breeze, hot apple cider and donuts, pumpkin picking, the works! And with a new month brings a new Currently! I love personal white boards. They keep students engaged during whole group and small group instruction and allow the teacher to see quickly what students know (or what they need support with). Due to my high risk pregnancy, I have been closely monitored these last few weeks with twice a week appointments. I have had weekly ultrasounds since 32 weeks (Monday I hit 34) but sweet baby Natalie has continually hidden her face from the camera. Until Monday....my birthday! She decided to give me a wonderful birthday surprise and peeked out for a brief moment. 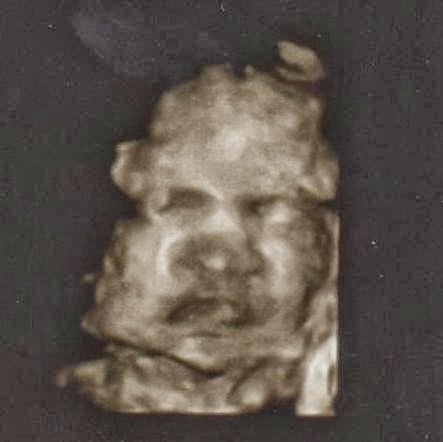 Just long enough for the ultrasound tech to snap a picture of her adorable face before she squirmed away. Only a few more weeks until I get to meet her. October is sure to be an exciting month! Link up with Farley at Oh Boy Fourth Grade for more Currently fun. Oh my gosh! You must be so excited! I loved the weeks leading up to the birth of both my girls. You will do great. Best wishes! Babies are so exciting. I have 10 nieces and nephews. One of each that I haven't met yet because they live too far away and were born within days of each other the first week of school. Enjoy every second. Hi Jennifer! Congratulations on your sweet baby! :) I am so excited to find your blog! I teach in Apalachin, NY ( near Binghamton) and don't find many NY bloggers! LOVE those dry erase pockets. I am your newest follower! Great birthday gift from your baby girl. But I noticed the ultrasound picture, it's not good enough. The picture should be more precised given that she's already 34 weeks. Anyways, happy October to you and to your family. It is wonderfull surpice, but if you want to know more about ultrasound visit this site.